Here they are! Finally available! 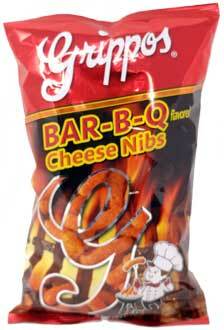 Grippo's BBQ Cheese Nibs 5oz Bags in a 12ct Box. The iconic cheese puff has been taken to the next level. What do you get when you combine the goodness of a cheese puff with the unmistakable taste of Grippo's Bar-B-Q Spice? An empty bag! These cheese nibs are that good. Buy a box now! I do love them. I purchased a bag here @ home (Louisville) unfortunate I haven’t not been to find anymore ? I decided look online, so excited to licate your web site, was able to purchase a box, they are delicious !!!!! Very pleased with my order!!! !